Because the 555 CMOS Timer can burn out if the 9-Volt battery is touched backwards on the battery clip, it is wise to add a 1N914 Switching Diode to the circuit. This diode allows a current to flow in only one direction. If the battery is ever touched backwards when changing a battery, the circuit will be protected by the Switching Diode. 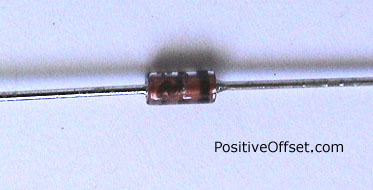 The diode has a positive and ground end (which is marked by the black band on the diode). The photo above shows the black band near the right side, meaning that the right lead wire is the (-) ground. If you intend to use the Switching Diode with our Zapper Breadboard Kit you simply replace the yellow jump wire from (J8) to (+) with the diode. The black ground end of the diode is placed near pin 8 of the 555 CMOS Timer at (J8), and the positive end is placed into the (+) row of the breadboard. The 1N914 Switching Diode is not part of Dr. Clark's published zapper circuit, and so it does not come with the kit. For those who want to add battery protection to their hand made zapper, the 1N914 Switching Diode is sold separately. Order one for each zapper kit you intend to build, or upgrade a kit you already built.